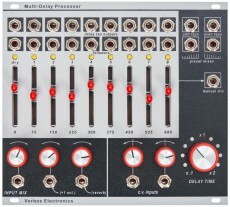 The Multi-Delay Processor isn’t just a high-quality echo effect, but was designed to be a fundamental ingredient of patches. Its core is a bank of eight digital delays, which are wired in series. Together, the circuits form a multi-tap echo. The volume of each signal repetition as well as the raw material can be adjusted via faders. Furthermore, there are individual audio and envelope follower CV outputs for the dry signal and all taps. An analog clock is used to control the echo circuits. The delay time can be set manually via a potentiometer plus there are two CV inputs with bipolar attenuators. Altering the delay time parameter during operation leads to pitch effects. At this point at latest, you’ll realize the superiority of the serial memory design used by Mark Verbos over average effect chips. 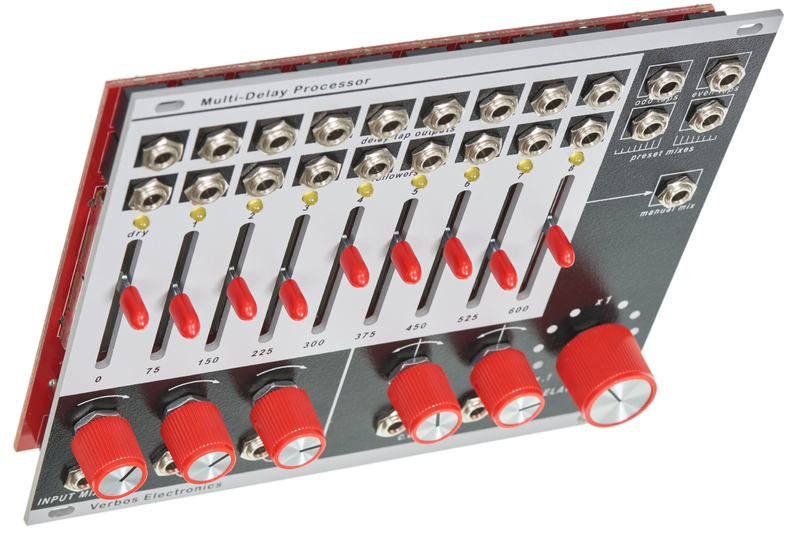 Despite its digital core, the Multi-Delay Processor offers charming sound reminiscent of a classic bucket-brigade device. – Only cleaner and more transparent. 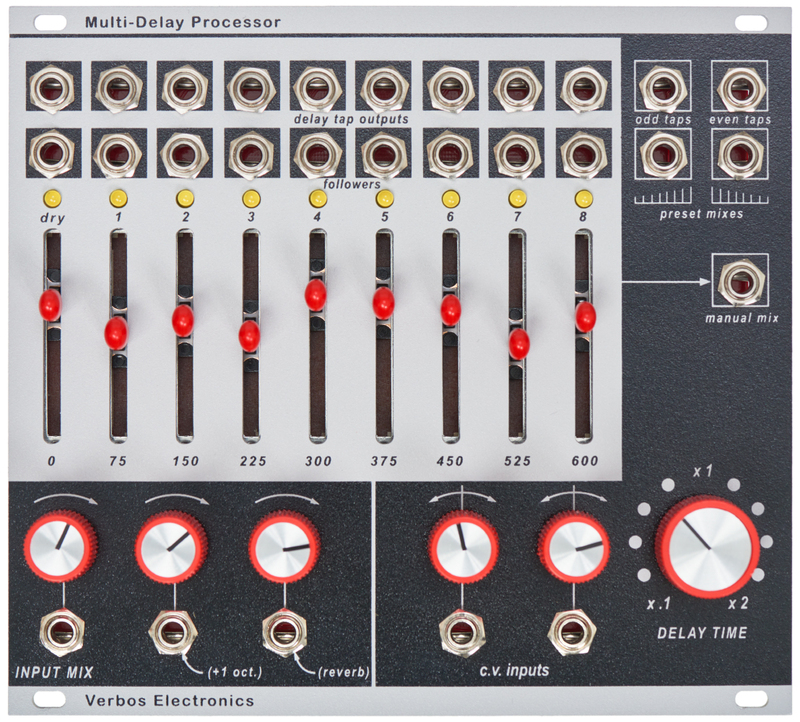 A three-channel mixer with dedicated level potentiometers adds analog character to signals before they are fed to the delay circuits. Without patch cables plucked into the second and / or third input, you can use these channels as feedback paths with additional effects. In detail, a pitch shifter calibrated to +1 octave (channel 2) and a reverb (channel 3) are available. – A perfect setup for creating shimmering echoes and other atmospheric effects. High feedback values make the module self-oscillate. In contrast to the multi-tap delay, which consists of individual components, an FV-1 chip is used for pitch shifting and reverberation. 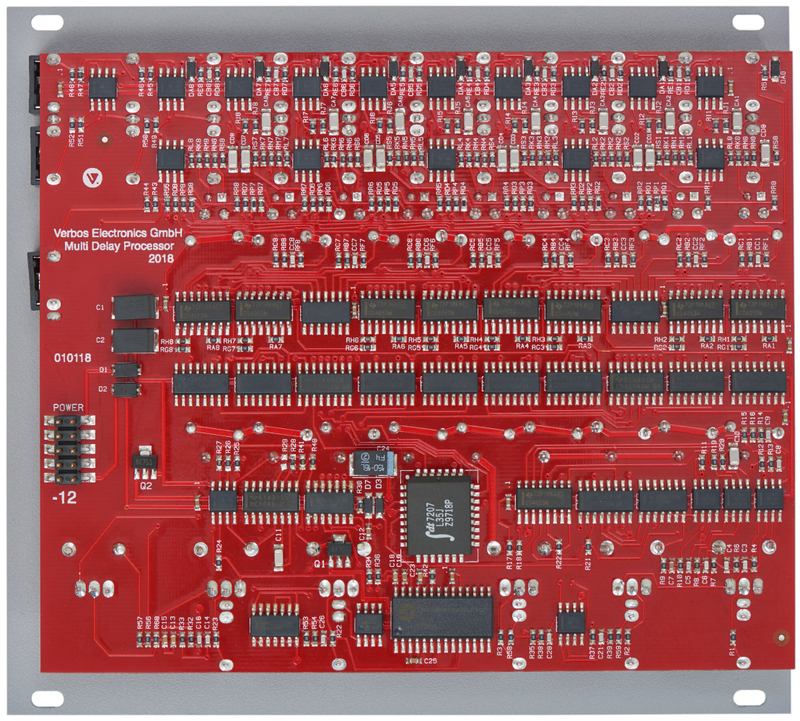 This processor is well-known, as it is the main component of multi-effects modules like the Erica Black Hole DSP and numerous guitar pedals. Here, the FV-1 is “just” a creative addition to the main effect. In addition to the manual mix output, which emits the mixture of raw and effect material dialed in via the faders, there are four other audio outs. Two of these connectors provide signals derived from summing up all even respectively odd taps. The other sockets emit preset mixes with increasing or decreasing level. – Very cool for quickly creating special effects.